The Areca Valley (Binglanggu) is located in the Ganza Ridge Natural Reserve on the border of Sanya City and Baoting County. It is named Binglanggu because it is formed by a valley, several kilometers long, covered with thousands of areca palms and lush jungle on both slopes. The reserve comprises three major features: the primitive Li Minority village, the ecological Miao Minority village, and tropical jungle. It is one of the most important tourist attractions in Hainan. The Li minority ethnic group has a history of several hundred years. Here you can enjoy the sight of the oldest groups of areca palms that are at least one hundred years old. Here you will have a look at the disappearing boat-shaped huts in the traditional Li people's building style, considered a unique construction as it is a skillful combination of the features of sea and mountain. This style indicates that the Li people settled here from far across the oceans ages ago. Here you can have a close look at the authentic Li body art, as precious as the well-known Dunhuang frescoes in Gansu province -- the few tattooed old women still alive. 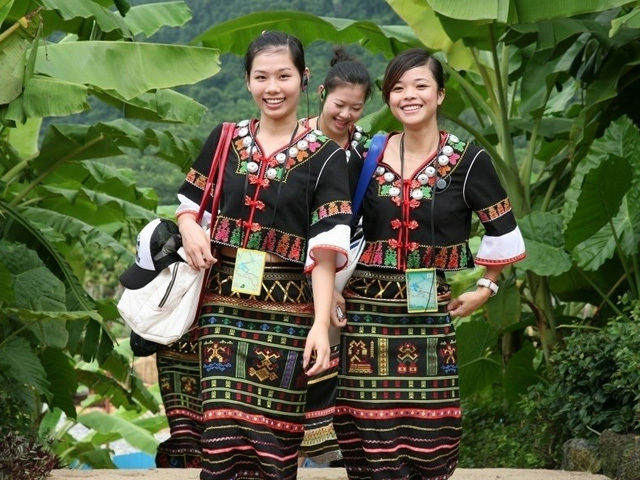 Their tattooed skins indicate the Li women's vicissitudes of life. Primitive house of Li people. Li minorities girls in areca valley. Here you will find that the Li people's ancestors wore clothes made from poisonous tree bark in the days before weaving. You will be surprised to see century-old granaries, which are not found in any other place on this island. These granaries, without locks, prove the honesty and integrity of these people who would not steal anything from any house, even though not bolted at night. Here you can appreciate ancient, distinctive, highly-advanced weaving devices and a beautiful display of textile craftsmanship: spinning, dyeing, weaving and embroidering. The Li people's brocade is shown, along with the largest Ming dynasty (1368 -- l662) quilt with a pattern of a dragon, kylin (Chinese unicorn), and double phoenix; this is the only example on Hainan. Here you may see some of the Li people's ancient musical instruments made of ox horns, logs, bamboo and coconut shells. In addition, we boast a number of state-preserved intangible cultural heritage items including drilling wood to make fire, making pottery at low temperature and performing Li folk songs. 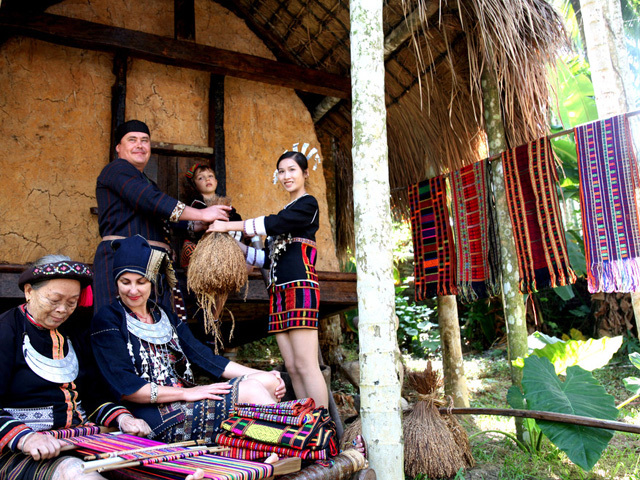 The Miao people are the second largest minority ethnic group on Hainan Island, claiming to be the descendants of the former Chiyou tribe. When entering the Chiyou village of the Miao people, you would feel as if you were visiting a primitive tribe of ancient times. The Miao people live in small log cabins in the mountains, with the floor a bit off the ground. Miao girls wear puttees (strips of cloth wound around the legs), pleated skirts and blouses with wide lapels, and large silver rings around their necks. Miao boys are rough-and-ready, rather wild and daring, and can perform amazing stunts. The primitive rainforest valley is located at the end of the Wuzhi (Five-finger) Mountains. With brooks gurgling down, what natural tropical rainforest scenery! It is free from the blazing hot summer and the piercing cold winter, with an average annual temperature of between 15 and 20 degrees centigrade. The content of negative ions is favorably higher than that of the state-proclaimed norm, so it is regarded as a natural oxygen bar where there are soft-shelled turtles, pythons, monitor lizards, tropical evergreen trees, wild white tea trees and many other flora and fauna included under second-class state protection. To cross to the opposite side of the hill, you can glide on a zip-wire over the valley and enjoy a five-minute thrill in the air. After coming to a stop you can tour the resort by tram.